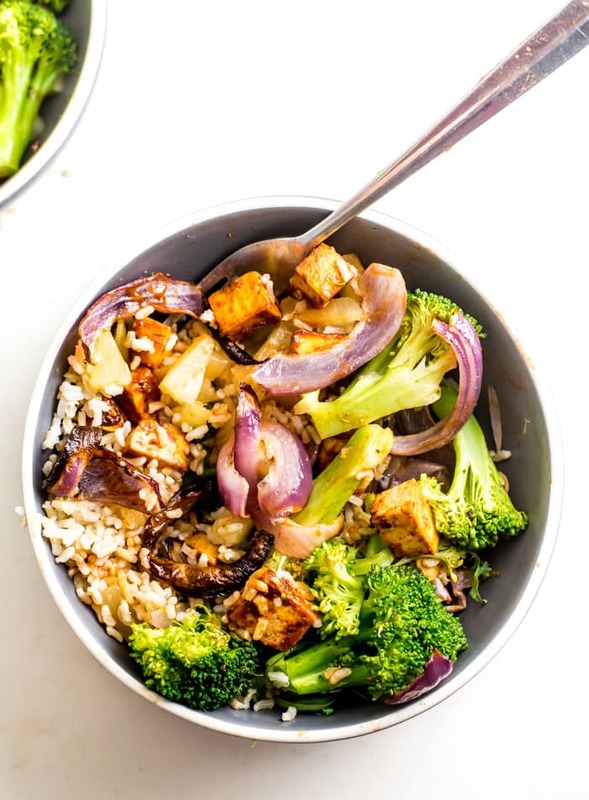 These vegan BBQ tofu bowls are made with just 6 simple everyday ingredients. 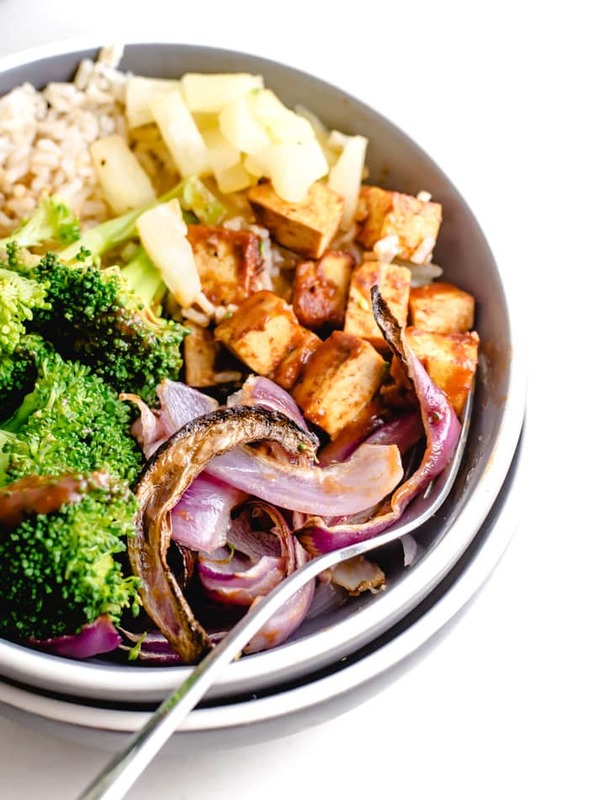 You’ll need tofu, BBQ sauce, brown rice, broccoli, pineapple and red onion. This recipe is healthy, easy to make, works well for food prep and tastes great. Let’s take a look at what this simple recipe has going on. Tofu. Tofu provides the protein in this recipe. It’s easy to make too. Simply cube it, toss with BBQ sauce and bake until crispy. I would recommend using firm or extra-firm tofu in this recipe but you can use medium tofu in a pinch. For more information on tofu, check out my guide to tofu and tempeh. BBQ Sauce. I used store-bought vegan BBQ sauce for this recipe. If you’d like to go with a homemade sauce, you can use my vegan BBQ sauce recipe or any other recipe you enjoy. When choosing a BBQ sauce, look for one without high fructose corn syrup and if you want it to be vegan, watch for added milk and anchovy. Broccoli. Steamed broccoli adds fibre, vitamins and minerals to the recipe and adds that hit of green. Cruciferous veggies like broccoli are powerful anti-cancer foods and we should try to include at least 1-2 servings of veggies from this family, such as kale, cabbage and cauliflower, daily. Brown Rice. Brown rice adds energizing complex carbohydrates to this recipe along with fibre and essential vitamins and minerals. Brown rice is fantastic and can be a healthy part of a plant-based diet. For more information on brown rice, check out my guide to whole grains. Red Onion. Roasted red onion is naturally sweet and tangy and works well with the BBQ tofu. Pineapple. I love the pineapple in this recipe paired with the tangy red onion and BBQ sauce. Plus, pineapple is good for digestion and has anti-inflammatory properties. You can use canned or fresh pineapple. If you’re not into pineapple, no problem! Try some corn, avocado, grated carrot or sliced red bell pepper instead. My “recipes” are more like guidelines and inspiration for you to create your own easy vegan meals. This one was hard to keep to just 6 ingredients but I think the six that did make it to the final recipe were the right choice. That being said, there are about a dozen other ingredients I was thinking of for this. If you want to add one or two extras, here are my suggestions for extra ingredients and substitutions. Diced bell peppers or roasted red peppers. Roasted sweet potato, in addition to or instead of the brown rice. Quinoa or any other whole grain instead or brown rice. Black beans, kidney beans or pinto beans. I think my top picks in there would be avocado, corn and cilantro. Prepare the tofu and onion and get them in the oven. Start the brown rice. I used quick cooking brown rice so it only took 10 minutes. If you’re using regular brown rice, start it first as it needs 45 minutes to cook. While those are cooking, steam the broccoli using a steamer or covered in a pot with a bit of water. Once everything is cooked, assemble the ingredients in bowls and serve. This recipe works great for meal prep. You can either prepare all the ingredients and store separately to mix-and-match during the week, or you can assemble 4 containers-worth and store in the fridge so they’re ready to grab-and-go as needed. The brown rice and tofu make enough for 4 bowls. You can either make 4 servings of this or use the extra brown rice and BBQ tofu to make my BBQ Rice and Beans Bowls. You could also use the extra rice in my Brown Rice Burrito Bowls. 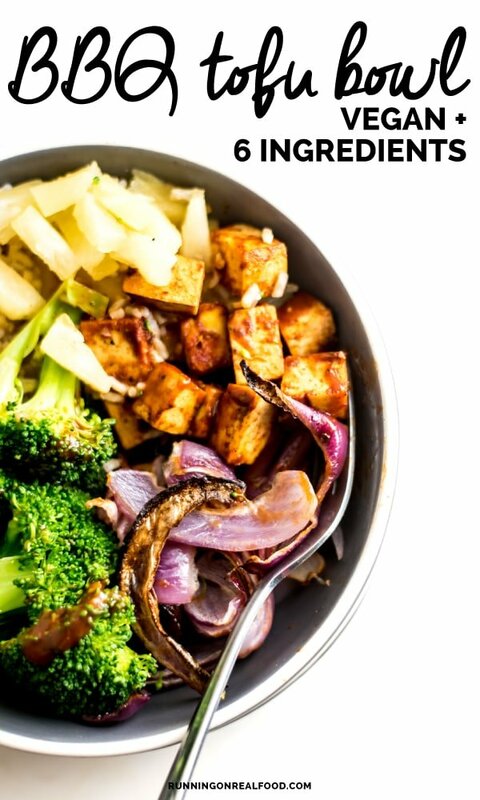 You could also make extra roasted red onion to add to buddha bowls throughout the week and if you have extra pineapple, you could make my Pineapple Cashew Cauliflower Rice. If you’d like a visual of the recipe, watch the video below to make this recipe with me. 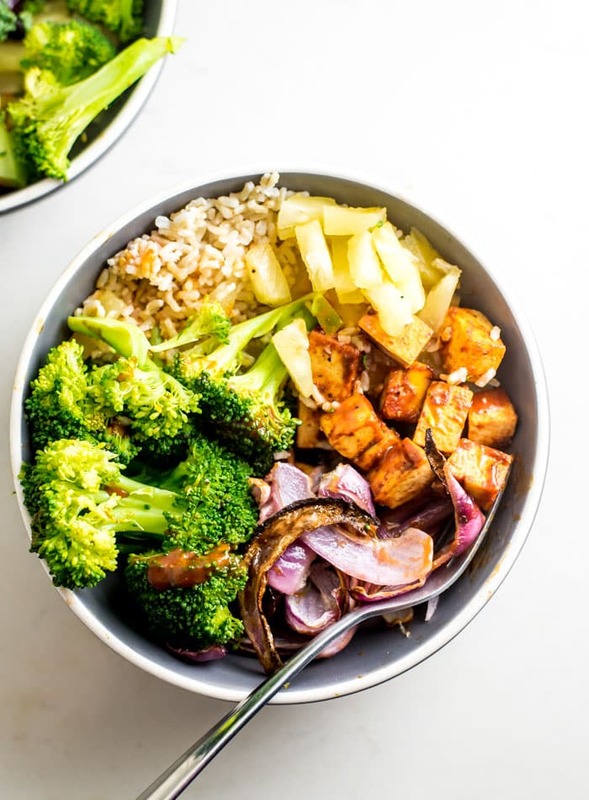 Easy vegan bowls featuring BBQ tofu, steamed broccoli, roasted red onion, brown rice and pineapple. These bowls are easy to make with just 6 simple ingredients. Enjoy them for a healthy option during the week or make them as part of your weekly meal prep. If you need to cook some brown rice, get that started now. To make the tofu, cube it and add to a bowl with the BBQ sauce. I marinated it for a couple hours but this is optional if you’re short on time, to marinate, prep the tofu first then place in the fridge for a couple hours before proceeding with the rest of the recipe. When you’re ready, add the tofu and BBQ sauce to a baking tray. Peel and slice the red onion into chunks and place on a baking tray. Add 1/2 tsp olive oil and a pinch of salt and toss well to combine. The oil is optional, you can roast them without oil if you prefer. 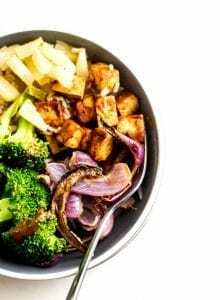 Place the tofu and red onion in the oven and roast for approximately 30 minutes until onion is starting to blacken. 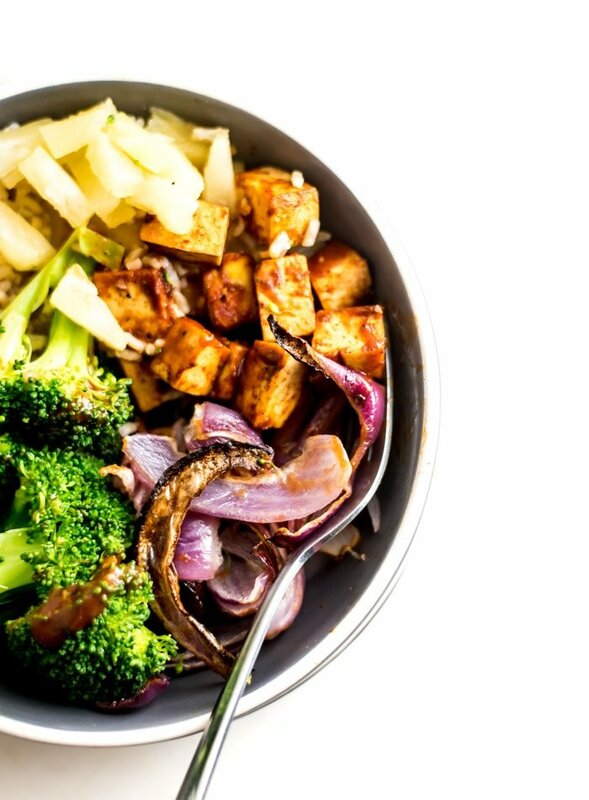 While the onion and tofu are roasting, steam some broccoli and prepare some pineapple. I used canned pineapple tidbits but fresh pineapple is good too. Once everything is ready and cooked, add a scoop of each to a bowl, top with a little extra BBQ sauce and enjoy.